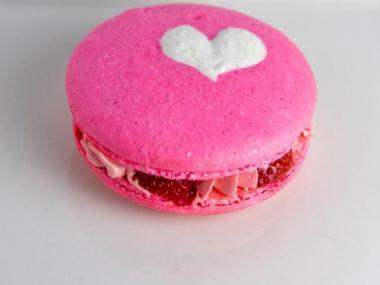 A strawberry macaron from Macaron Parlour. EAST VILLAGE — Bacon-filled French pastries are coming to the East Village. Macaron Parlour, which debuted a line of fancifully flavored sweets at the Hester Street Fair in 2010, is opening its first brick-and-mortar location this summer on St. Mark's Place, brokers said. The bakery has signed a 10-year-lease for 1,200 square feet, including an outdoor garden space, at 111 St. Mark's Place, according to New York Commercial Real Estate Services. Macaron Parlour will take both of the storefronts at 111 St. Mark's Place, including the one that previously housed the shuttered Chocolate Library, the brokers said. Founded by Christina Ha and Simon Tung, the bakery takes the traditional macaron and adds unusual fillings, from fresh strawberries to candied bacon and maple cream cheese. Macaron Parlour is also one of the only bakeries to use brown sugar in its macarons, the founders said.